Winter is now ramping up, and if you are a hunter who loves to hunt with your dog in the snowy season you are about to be one happy camper! Going out into the winter tundra with your dog can be a blast, but remember that your dog needs to be safe in the elements just like you. Here are a few tips to keep in mind when planning wintertime hunting with your pooch. 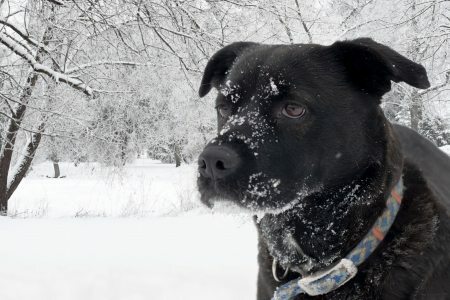 First and foremost, make sure that your pooch stays safe and healthy in the coldest weather. We know that you get a kick out of hunting with your dog in the cold temps. It’s an invigorating experience, but at some point, there is such a thing as it being too cold. If the winter weather dips below 0 degrees F, just keep your dogs inside and wait for a slightly warmer day. However, if your dog has been in the game for a while and is used to hunting and working in the cold weather, then let him do what he loves! As the cold season settles in, have your dog spend more and more time outside to help them acclimate to the winter climate. Plus, as they spend time outside, they will often grow a more thick and protective coat and become more used to the conditions, making them capable of spending more time out on the hunt. Humans are so lucky. We get to prepare for cold winter by wearing shoes and multiple layers of socks, but dogs aren’t so fortunate. However, it doesn’t have to stay that way. You can help your pooch stay warm during a day of hunting by getting them fitted canvas foot covers or boots with rubber padding on the bottom. While it will take a bit of adjustment and training for your dog to get used to these footings, they will bring a whole new level of comfort to your dog’s feet and he will love you for it. With all of this running and jumping around in the cold, your dog’s feet are sure to take a beating. Just like our hands and skin, exposure to the cold elements can result in cracking and splitting of the skin on your dog’s paws, which is just downright painful. Avoid this issue by moisturizing your dog’s feet when need be. There are other tricks you can use as well, including keeping fur on the paws well trimmed or even using a non-stick cooking spray to prevent ice build-up on the paws, says the Upland Gundog Association. Those native to Minnesota know how quickly the weather can change. A cold climate can become much colder once a strong wind hits, so be prepared for these instances. When you go out hunting, don’t go too far away from a heated area, whether that’s a hunting camp, a hunting blind with a space heater or even just your truck. Just like you, your dog will need a reprieve from the elements somewhere warm. Make sure the heater works in these places and that both you and your dog can comfortably fit and get warm when you need. If you are excited about building your family of hunting dogs, look no further than KT British Labs. We are Minnesota’s premier British Labrador breeder, and we stand behind every one of our dogs. Whether you’re looking for a puppy to train yourself or a started dog that has already been housebroken and learned basic obedience, we’ve got you covered. Learn more by giving us a call at 218-685-5103.